Home/Blog / Lip lifting to reduce the prominence of the upper lip and restore a beautiful smile. Show Your Beautiful Teeth! Sacramento California. Have you ever wanted to see more of your upper lip or teeth when you smile? Does your upper lip look a little long and our upper lip a little thin? Have you ever wanted to see more of the red part of your upper lip? Have you tried fillers and not achieved the look you desired of your upper lip or corners of the mouth? 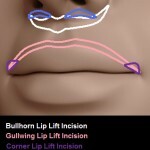 If you answered yes, then the lip lift (sometimes referred to as a bull horn lip lift) may be something to consider. At Chrysalis Cosmetics we are excited to offer the increasingly popular lip lift to help enhance your appearance and confidence. We wanted to offer this article as a way of introducing a procedure that often gets little press outside the facial plastic surgery literature. The origin of the lip lift most likely dates back to the time when we as plastic surgeons began repairing cleft lips as many of the techniques utilized have been enhanced and modified from reconstruction techniques. More recently they have been refined and have become a more sought after procedure for facial enhancement, especially as plastic surgeons have become more adept at augmenting the lips with facial fillers such as Restylane and Juvederm and implants such as the Permalip from SurgiSil. In the past, the lip lift was done on the lip itself. This incision was placed in the red/white junction border. This worked well for some and for others it left an incision or scar that was hard to hide without makeup or tattooing. 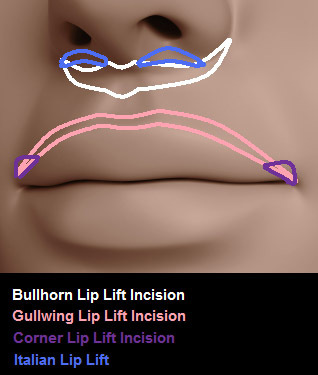 Many plastic surgeons now perform the lip lift from an incision under the nose (Bull horn Lip Lift). The incision is often hidden slightly better in this position and can be contoured to the nose as well. Lip lifting requires some tailoring of the procedure for each individual and the incision placement is often customized to achieve the lip lift required for optimal aesthetics. In many, a corner lip lift is often added, lifting the corners of the mouth directly to provide optimal lip balance. On occasion, filler can make the lip lift as well as bring the upper and lower lip volume into balance. Other procedures that can enhance the beauty of the mouth can be considered with the lip lift. For some, a nasolabial fold excision can be a welcome addition once facial volume and skin tone have been optimized through filler placement and laser resurfacing. There are many complimentary procedures to the lip lift that may enhance the final result as well as improve the overall aesthetic balance of the lip. Your plastic surgeon will be happy to discuss this procedure in more detail as there are so many exciting possibilities. Plastic surgery is not without risks, and healing from this procedure does take some time and results vary of course. Incision revisions can often ameliorate some delicate healing challenges. A little filler and a touch of laser may also be obligatory to optimize the result. Lip rejuvenation with lip lifting is an exciting neoadjuvant to the classic puff (Restylane or Juvederm) and buff (laser resurfacing with Sciton TRL) lip treatment. It can also be a welcome addition to freshen a previously completed facial rejuvenation. If you have any questions please give our office a call. 916-273-7435.